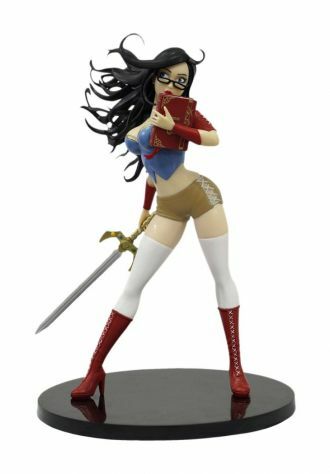 This beautiful figure stands 23 cm tall, is inspired by Jason Cardy's illustration of Zenescope's feisty heroine. With her signature black-framed glasses, Sela Mathers is posed with her sword, Lysraseri, and her powerful book of Fairy Tales, ready to bring consequences and not so happy endings to those who do not heed her warnings. Limited to 1750 pieces worldwide.